There were two limited edition ciders for 2013. These ciders were created with both competition and trial in mind. A few were even released with the original names before the cider was blended together to form the Fruitwise 2012 Vintage Cider - slightly less limited edition with a bottling of around 250. Dabinett, Yarlington Mill, Kingston Black and Kidds Orange Red. OK, so the name could have been simpler, but each of these varieties are charismatic and distinctive in their own right. Another silly name, but this time some very serious fruit! 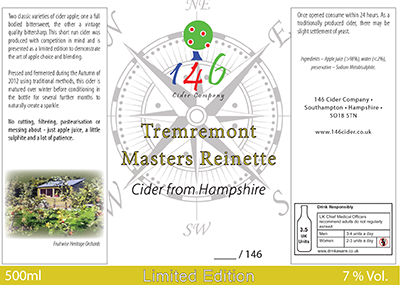 Tremletts Bitter, Harry Masters Jersey, Egremont Russet and Orleans Reinette produce a bold cider with a very interesting charisma. Both Tremletts and Harry Masters deliver big tannins and a full body, whilst Egremont and Orleans are nutty, old fashioned dessert apples with high flavour and reasonable acid.